Here's a great recipe for families of any size. Called a dutch puff, it's kind of like a puffy eggy creation. Similar in taste to french toast, but totally its own entity, we like it with syrup. Melt 1/3 cup of butter in a glass dish in a 425 degree oven. Once blended, pull the dish out of the oven (once all the butter has melted), and pour the liquid mixture into the dish. It's OK if butter mixes in a bit, stays around the edges, or gets on top. Put the dish back in the oven for 20-25 minutes... until it puffs up and the tops of the peaks are brown. That's right... I said "puffs" and "peaks". It will puff up into what might look like a mountain range, with each corner reaching up toward the top of the oven, or with random peaks throughout the pan. Serve hot, cut up into squares and it will thrill your family. Not only does it taste good, but it's inexpensive & easy to make, AND-- because it's got the eggs in it-- it's full of protein and so it sticks. They're not hungry 20 minutes later like sometimes happens with cereal. Hope you and your family enjoy this delicious recipe! This looks fabulous -- I think I'll try it for 4. For some reason, I've never taken a picture of ours-- but the kiddos LOVE to watch to see how high it will rise. As I mentioned on the other post, I make it for SIX just for my four children, six and under, so you may want to do a generous portion if you're just serving it up with syrup. If you add on jelly, fruit, and other items then feel free to serve it up as recommended in these original portion sizes. 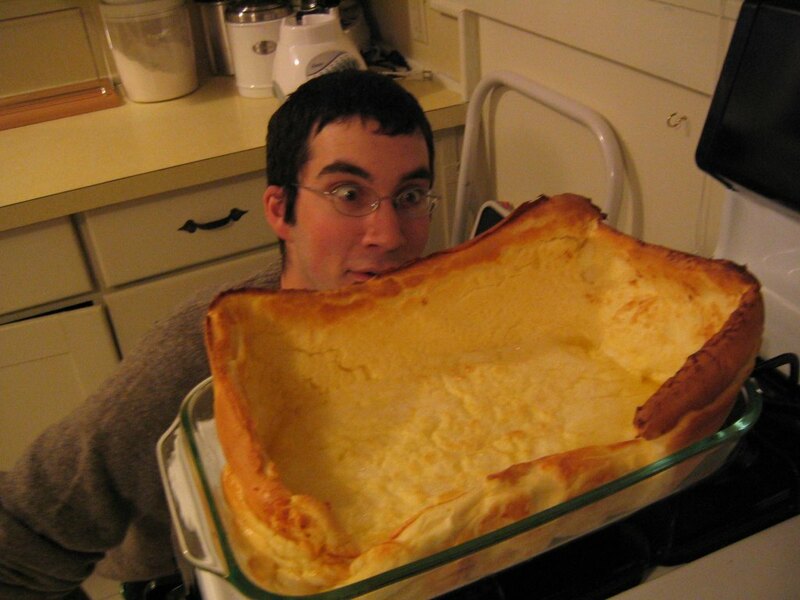 We make this ALL the time, but it is called "German Pancakes" and it is SO delicious. I will try your recipe and see how it compares. Well, next time I will make this in my oven instead of toaster oven! I let it "peak" until it hit the top, then I had to take it out!! It probably should have cooked a bit longer, but it was AWESOME nonetheless!